The bizarre implementation of National Register of Citizens (NRC) and the proposed Citizenship Amendment Bill have proved a nightmare. Assam is on the brink of a huge and invisible crisis. Its beautiful landscape, annually ravaged by the fiery floods in the Brahmaputra valley, across its green geography, is currently ridden with widespread fear and insecurity, mass phobia and trauma. Indeed, this could lead to fissures and ruptures in the social fabric of this sensitive and strategic border state in northeast of India, and could move beyond redemption. 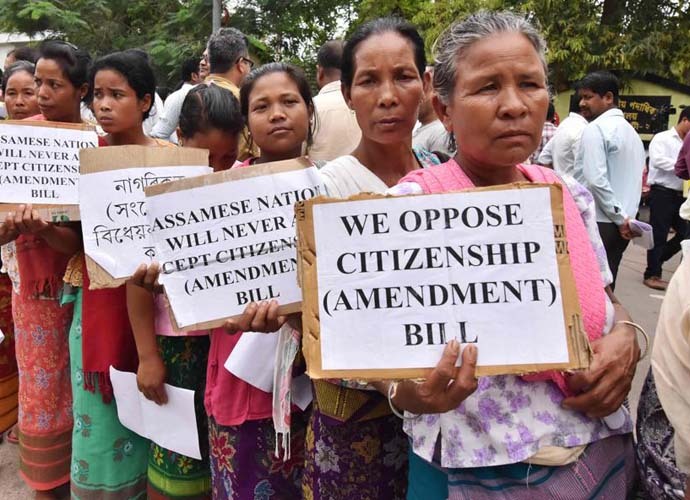 The current crisis revolves around two issues which have hit at the core of the state's social and political identity: the National Register of Citizens (NRC) and the proposed Citizenship Amendment Bill. The bill, which was first tabled in Parliament on July 15, 2016, is backed by the ruling BJP, while it is being vehemently opposed by All Assam Students Union (AASU) and its political front, the Asom Gana Parishad (AGP). The NRC is backed by both the BJP and AGP. The AGP is now in alliance with BJP in Assam to "stop the Congress and help the state recover from its bad governance". The Congress was in power in the state for 15 years with Tarun Gogoi as chief minister until it was defeated in the last Assembly elections in 2016. However, Prafulla Kumar Mahanta, founder president of AASU, and two-time chief minister of the state, told this columnist categorically in Guwahati on June 29 that the "AGP will break the alliance with the BJP if it pushes the Citizenship Amendment Bill". The AASU led a big rally in Guwahati on June 29, and there were protests across the state on the issue. The party is convinced that the 'original inhabitants' of Assam and its indigenous people are already facing the brunt of massive demographic changes because of the influx of refugees post-Partition in 1947. The situation is such that it is argued that they will become a linguistic minority in the face of the new influx if the bill is passed — pointing to the10 per cent Bengali-Hindus now based in 'secular' Bangladesh under Sheikh Hasina's leadership. If the bill is passed, Assam will become a "dumping ground" for Bangladeshi Hindus, they contend. The Citizenship Bill seeks to radically transform the category of 'illegal migrants'. The bill will amend the Citizenship Act, 1955, to provide citizenship to illegal migrants from Bangladesh, Afghanistan and Pakistan, who are of Sikh, Parsi, Buddhist, Jain, or Christian origin. Muslims are not included in this Bill, including those who are facing persecution in Pakistan, such as the Ahmadiyyas. This schizophrenia originally emerged from the contentious 'foreigners' issue which has stalked Assam's borders and mainland since the Partition of India in 1947. It deepened after the Bangladesh War of Liberation in 1971 in which India actively participated and which led to tens of thousands of refugees camping in India. The protracted and often violent movement on the foreigners' issue led by the All Assam Students' Union from 1979 to 1987, which rocked the state, and whose reverberations are still felt across the interiors, also added to the fears. The Nellie massacre of February 18, 1983, with the guilty not punished till date, is still etched in the minds of the people. However, the most predominant fissure that might mark a new phase of deep division and insecurity is the process of detection of "foreigners" under the NRC, spearheaded and fast-tracked by the BJP-led regime, under the supervision of the Supreme Court. The NRC had released its first report on December 31, 2016, in which 1.9 crore of the 3.29 crore applicants were declared as 'Indian citizens'. The second and final report (to be reportedly revised once again in December 2018) was meant to be released on June 30. However, it has been postponed till July 30, due to floods, as stated by the authorities, under the auspices of the apex court. Under the Assam Accord, the midnight of August 24, 1971, is the cut-off date for citizens to be declared Indians. Any individual who has entered Assam after that date will be declared 'foreigner'. A massive exercise like checking out credentials of lakhs of individuals as bonafide Indian citizens or foreigners is a priori a gigantic and complex task. It has thereby fallen into a trap of accusations of bias, prejudice, and partisan conduct, with widespread controversies, confirmed and unconfirmed reports of fudging of evidence, racial and chauvinistic profiling, targeting of minorities, questionable, illegal and arbitrary detentions and arrests, and large-scale unrest and phobia. Thousands of citizens are under the scanner of the 100 Foreigners' Tribunal, running to and fro from this hearing to that, holding bagful of documents (16 crucial documents are required, reportedly), trying to prove their citizenship. If they have to appeal - they have to approach the one-judge divisional bench of the Gauhati High Court, something most of them find extremely difficult to do. If the high court bench rejects their appeal, they have to go back to the tribunal else they are simply declared as 'Doubtful Voters (D-Voter)' with a 'D' marked against their names in the electoral list. They can then be branded as a foreigner in other cases and packed off to jail, which serve as detention centres. In the 'detention centres', they have no prison rights and are treated as 'undertrials. They are condemned as 'foreigners', this includes even those voters who are under scrutiny because of technical or official anomalies in their documents. It is an arduous, difficult and sensitive exercise directly affecting thousands of families, their emotional and national identity, their social life, and livelihood. In many cases, families, especially the poor and illiterate, are ravaged, torn apart, and pushed to the brink of devastation. And this can run into tens of thousands because the 'D-Voter' list itself goes beyond the official 1.25 lakh mark, and might only be rising. Unofficial estimates by activists claim that 35 lakh or more people might be affected by this NRC exercise. Most of those directly impacted are Bengali-speaking Hindus and Muslims. Most of them are poor and inhabitants of far-flung areas. A large number of women have been declared D-Voters because they have no birth/school certificates, no marriage documents and many of them have never voted. The panchayat certificate with magisterial powers was declared null and void by the court, but was accepted finally by the Supreme Court. Despite this there are allegations that the Foreigners' Tribunal (often accused of bias by locals with the allegation that those sympathetic to BJP-RSS and AASU have taken over the tribunals) refuses to accept the panchayat certificate as a valid document. This columnist found a Hindu Rajbangshi husband in a village in Chirang, Kokrajhar who has been declared a bonafide Indian citizen but his aged wife, however, has been packed off to jail as a 'foreigner'. An old woman in Jaipur village in Barpeta district is rotting in a Kokrajhar detention camp for the last three years though all her sons have been declared Indian citizens. A young pregnant woman in Krishna Charali village in Goalpara district might have her entire family declared as Indians, but she was picked up by the police before a court hearing and packed off to a detention camp as a 'D-Voter'. The woman was released on bail at the time of her delivery. She doesn't even know what her crime is. Could it be because her primary and middle school certificate had technical anomalies? Entire blocks and villages have been branded as 'doubtful' only to be later declared as citizens. Thousands have not been served notices for hearing at the tribunal, and majority of villages have no access to their names being listed on internet. If they miss the hearing because they have not been issued written notices, they might get picked up by the Assam Border Police, or declared 'foreigners' or D-Voters by the tribunal. It is a totally Kafkasque nightmare in the interiors of Assam. Many are hanging in a traumatic twilight zone, running from pillar to post with documents to prove their identity. One brother might be an Indian citizen, but the other is in jail/detention camp. A bonafide citizen can be declared a non-citizen in no time even if he might have voted in various elections. "We are helpless and hopeless," said a lawyer in the Goalpara district court. "The crisis has reached a peak. This will only lead to mass unrest."